This both lovely and affordable top that retails at £12.00 comes in three different colours (this one being my favourite) and could be styled perfectly with a dark denim jean. The long sleeves make it ideal for winter, although with the Bardot neckline a scarf might be a good idea! This comfy sweatshirt from Nike that retails at £45.00 is also ideal for the cold months. With it being Nike it means it comes with a steeper price than other similar sweatshirts that can also be found on Asos at a much lower price, but if you're shamefully a bit of a brand girl like myself and don't mind paying the extra then this sweatshirt is ideal! 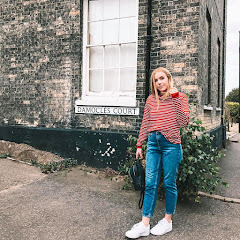 These light wash jeans from River Island that retail at £42.00 could be paired with just about anything you have in your closest. The versatileness of them make the price worth it, as well as that with jeans I always believe that in most cases you get what you pay for. For me that means repeat purchase of Topshop's famous Joni Jean. The stylish 'Busted Knee' adds to the look of these jeans and would help finish any look off nicely. This beautiful wrap blouse from River Island which retails at £34.00 is to die for! It would be perfect either for more casual outfits, for example paired with the jeans which I speak about above or you could even dress it up to be suitable for going out. This top might just be in my basket ready to order! Hope you've enjoyed & let me know if there is anything you've personally been lusting for over on Asos! Love Bardot necklines, such great outfits love them all! I have never bought anything from Asos before! Although I've heard of it. Sometimes shipping can be a bit much when you live across the ocean, haha. Cute picks though! Follow for follow? love the check wrap blouse - looks like such a flattering style!